Following the fracas that occurred after UFC 229’s stunning main event, the NSAC has since frozen UFC lightweight champion Khabib Nurmagomedov’s $2 million payday. Beyond that, Nurmagomedov is threatening to leave the UFC if his teammate is not reinstated after being banned for his part in the UFC 229 brawl. Hip-hop icon 50 Cent has since landed a partnership with competing mixed martial arts promotion Bellator MMA. Taking to social media, 50 Cent has since offered Khabib Nurmagomedov $2 million to transition from the UFC to Bellator MMA. 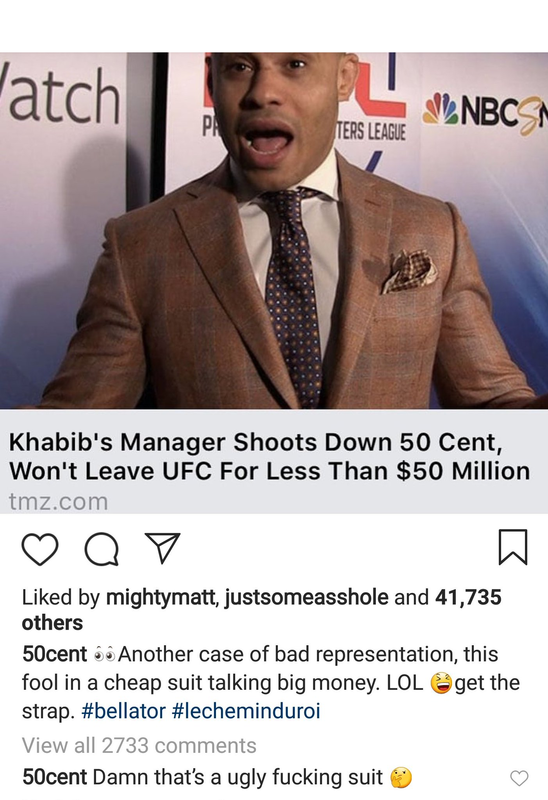 Speaking in a recent interview, Nurmagomedov’s manager Ali Abdelaziz went on to decline the offer and criticize 50 Cent for the “garbage” deal. Now taking to social media, 50 Cent has issued a critical message to about Ali Abdelaziz. While the message has since been deleted, a screen shot of the statement may be viewed below. “Another case of bad representation, This Fool in a cheap suit talking big money.” 50 Cent said.